Summer is a great time to whip up a headband or two, big and bright and cool in cotton mesh. 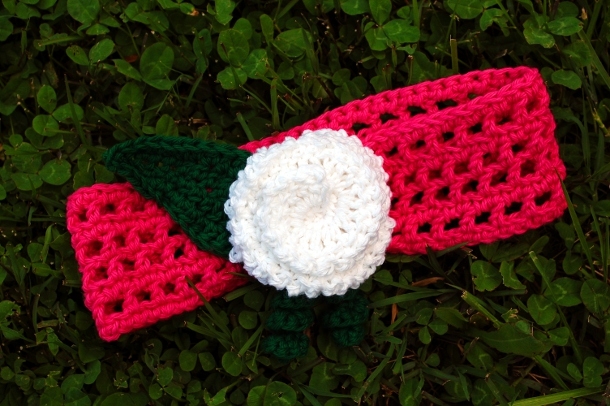 Perfect for barbecues, picnics, and trips to the zoo, this headband can be made with or without the flower – depending on the look you’re going for. 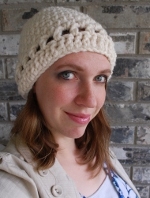 Gauge: Gauge is not critical in this design as long as the first row will fit onto your head. Rnd 1: With MC, ch 68 (or desired head circumference with an even number of chains), join. Ch 1, sc around, join rnd. Rnd 2: Ch 3 (counts as 1 dc + 1 ch), sk 1 st, *dc in next st, ch 1, sk 1 st. Repeat from * around, join rnd. Rnd 3: Ch 1, sc in each dc and ch-sp around. Join. Rnds 4-5: Repeat Rnd 2. Rnd 7: Repeat Rnd 2. Rnd 8: Repeat Rnd 3. Finish off, leaving at least 8 inches of yarn at the end. Row 1: With white, ch 21. Sk 1 st, sc across. (20 sc) Turn. Row 2: Ch 1, make 2 sc in each st across. (40 sc) Turn. Row 3: Ch 2; make 2 dc in each st across. (80 dc) Turn. Row 4: *Ch 2, sl st in next st. Repeat from * across. Finish off. Rnd 1: With green, ch 12. Sl st in each of the first 3 ch, sc in the next 3 ch, hdc in the next 3 ch, dc in the next 2 ch, make 6 dc in next st. Continue working in opposite side of ch. Dc in next 2 ch, hdc in the next 3 ch, sc in the next 3 ch, sl st in the last 3 ch. Do not turn (work in the round). Rnd 2: Sl st in the first 3 sts, sc in the next 3 sts, hdc in the next 3 sts. Dc in the next 3 sts, make 2 dc in each of the next 4 sts, dc in each of the next 3 sts. Hdc in the next 3 sts, sc in the next 3 sts, sl st in the last 3 sts. Finish off. Vine (make 2): With green, ch 21. Sk 1 st, make 2 sc in each ch across. (40 sc) Finish off. Use loose end to gather headband together at join. This may be done by wrapping the ends around the join and pulling tight; weave in ends. 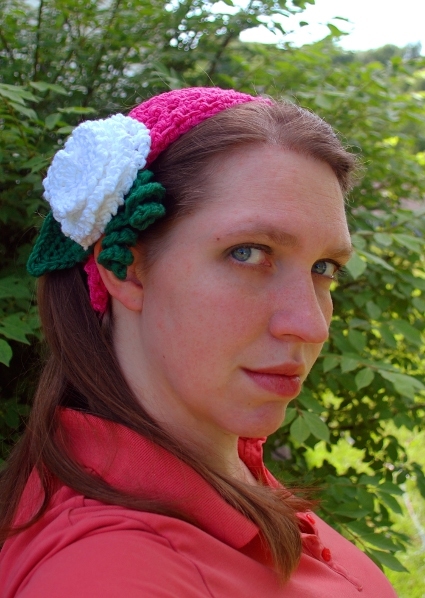 Sew leaf and vines to headband at join. Coil flower into desired position and sew in place.